DPR SKN is skin care that goes deeper. Our philosophy is about helping people to get on a deeper level with their own skin care by integrating wellness and self-love to promote a healthy lifestyle. Through our product and the Journal, we share our advice, skin care and wellness tips, and overall how to be the best you can be. We love to read interviews and get a glimpse of people’s lives. We see that all day long on social media but do we really know each other? Tell us a little about yourself… name, age, where you live, what you do, etc. Hey y’all! My name is Lindsay. I’m 21 and live in San Diego, CA. I am originally from Virginia. I moved out to California to pursue my dreams. I gained my professional makeup artist certification in Beverly Hills through Bosso Makeup and continued my education at esthetician school from Palomar Institute of Cosmetology and received my license a year ago. I currently work as the lead esthetician at a spa and resort in Rancho Santa Fe and attend the Fashion Institute of Design and Merchandising (FIDM) to earn my degree in beauty marketing and product development. Since you’re studying about the beauty industry and you’re an esthetician you probably have some amazing skin care and beauty tips, any you’d like to share? One of my biggest tips would be to exfoliate 2-3 times a week or every 3 days. Exfoliation helps remove the dead skin cells that are sitting on the surface of our skin. If you don’t exfoliate regularly you might notice that your skin may feel rough or dry, and appear dull. Exfoliating also helps with acne and oily skin. It opens up the skin which helps impurities come forward. Exfoliation helps oily skin slow down the oil production because of the increase in cell turn over. Exfoliating helps to treat anti-aging, wrinkles, and it increases product penetration into the skin leaving your skin with a healthy glow. I always recommend to use a mask after exfoliating to get a good amount of product into your skin for your skincare goals. 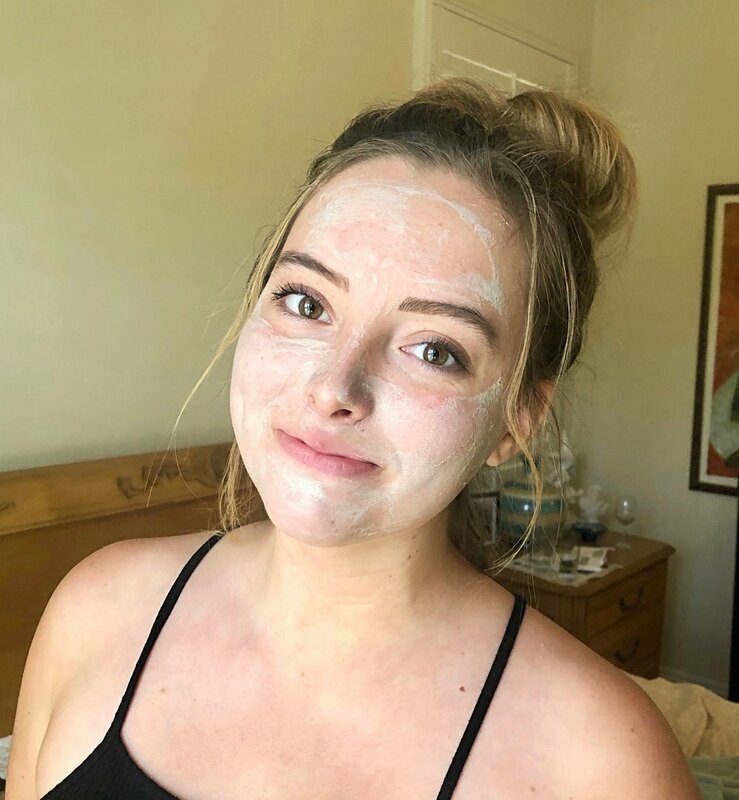 I love the DPR SKN Clay Mask (and I have tried many a mask) because it helps detox the skin, heal acne, and also has hydrating and calming ingredients. It is almost like a 4-in-1 mask, when masks usually only give you one benefit. *Editor’s note: The Clay Mask will give your skin a gentle exfoliation when applied as a full face mask if you don’t have an exfoliating cleanser. Sunscreen, sunscreen, sunscreen! Sunscreen is one of the most important products to have in a skincare routine. It protects our skin from UVA, UVB and now BEV light or blue light from our phones, tablets, TVs and laptop...crazy right?! All of this increases aging, wrinkles, hyperpigmentation, and higher chances of skin cancer. We all tan when we’re young and just because we don’t get sun spots right away does not mean they are not there. Even if you cannot see them, they are hiding under your skin and as you get older, the sun spots will start to come forward. Tanning is essentially laying our bodies in a fryer. When you have that nice golden tan, it is actually just a bunch of dead skin cells sitting on the surface of your skin (did I mention our skin is the largest organ on the human body? ), and because of this we can get deeper wrinkles once we are older and/or start getting them at a young age. If we are taught to workout, eat healthy and take care of internal organs, why not take care of our external organ? Even if you live in a cloudy location and cannot see the sun, behind those clouds the sun is out and its rays that penetrate through the clouds harm your skin. Look for sunscreen with zinc oxide and/or titanium dioxide, as these ingredients protect our skin the most. As an esthetician, what are some of your client’s primary skin concerns? Most of my clients’ skin concerns are usually to slow down aging and hyperpigmentation, aka sun spots. I usually recommend a deep chemical peel, IPL facial, and a good exfoliator at home three times a week. Of course I recommend lots of sunscreen because after a deep peel your skin is fresh and raw. Sun exposure can cause you to get a sunburn and/or bring forward more wrinkles and sunspots than before. Also, vitamin C helps with brightening and lightening the skin. After the healing process, your skin will look amazing! Please discuss with your local esthetician about which peel process would be best for you. And what are you biggest skin concerns? Oh gosh! There are so many! Haha! I would say acne breakouts, aging, hyperpigmentation and the loss of collagen and elasticity as I get older. I use the DRP SKN Clay Mask about two to three times a week or as a spot treatment whenever I break out. I cleanse twice daily with a gel cleanser and a charcoal cleanser, then I exfoliate and let it sit for 10 minutes. During this time I prep my mask and watch some Netflix or scroll through Instagram. Once I remove the exfoliator, I do extractions as needed before I apply the Clay Mask. I usually allow the mask to sit for 10 minutes before it is fully dry or I apply a light layer for an overnight treatment. That night or next morning I remove the mask and apply my eye cream, serums, moisturizers and sunscreen. I would say I take care of myself on a deeper level by getting my body moving everyday, even if it just a walk on the beach or running in the neighborhood. I do some yoga and meditation before going to bed to put my mind and body in a feel-good/relaxing state-of-mind. I stay away from coffee and soda as much as possible. I have replaced those with matcha or green tea when I feel I need it. I also have replaced sugar/sweets with veggies and fruit (I have the biggest sweet tooth in the world so it can be hard!). Drinking water and lemon water is also a big one! I have a water bottle that has time marks on the side so it challenges me to drink a certain amount of water before a certain time, otherwise I forget throughout my busy day. I embrace my natural beauty just by loving myself inside and out. Sometimes it can be hard, but that is okay. I continue to fall in love with myself everyday. Any last words or advice? Please allow your local esthetician to perform extractions as we are trained with the correct technique and pressure so it does not damage your skin. If you perform extractions on yourself improperly, it can cause broken capillaries and peeling of the skin. If you have any questions about your routine or services, you’re welcome to message me on instagram with any questions @GracenGritBeauty. Find peace and happiness within yourself, learn to love yourself and all your beautiful “flaws.” Don’t let others hold you back, but more importantly, do not hold yourself back from your own dreams and goals.